Shelter Cymru is presented with the prestigious Yellow Plaque award, in recognition of initiatives funded through gifts in Will. 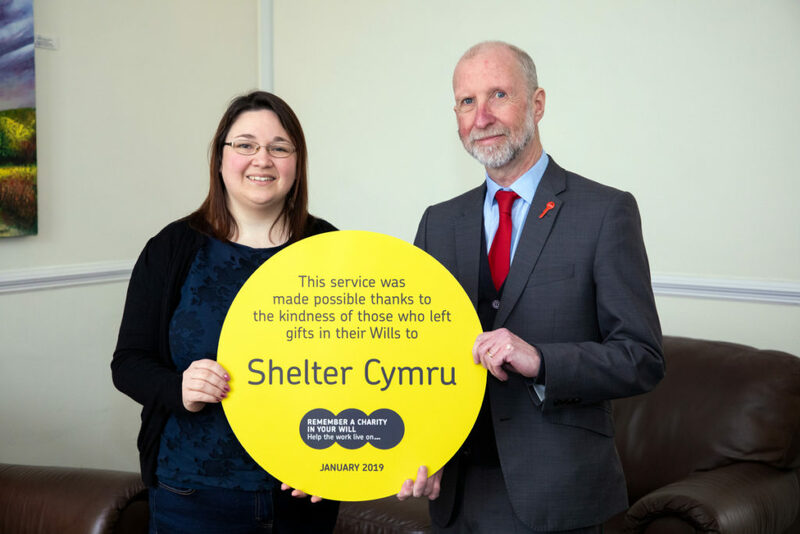 Independent Welsh charity, Shelter Cymru has been awarded a prestigious Yellow Plaque by Remember A Charity, recognising the gifts in Wills that help fund the charity’s pivotal work in preventing homelessness in Wales. Inspired by English Heritage’s Blue Plaques, the Yellow Plaque scheme commemorates charitable initiatives funded through gifts in Wills. Last year alone, gifts in Wills funded one in every fifteen people who were supported by Shelter Cymru, helping 1,328 people with housing needs across Wales. Across its 38 years, this fantastic charity has helped more than half a million homeless people in Wales fight for their rights, get back on their feet and find and keep a home. As well as providing free, independent, expert housing advice and support, Shelter Cymru also attends court to defend those at risk of losing their home. One of the charity’s key projects enabled by legacy giving is their national helpline, Shelter Cymru Live, which supports over 6,500 people each year, over 2,000 of which are children. This is often the first port of call for anyone in housing need, providing immediate specialist support, negating the need to wait days (and sometimes, weeks) for an appointment with a Housing Law Caseworker, removing the additional distress this can bring at an already stressful time. One in four people helped by Shelter Cymru now come through their helpline, which has grown to become a vital and integral part of the support they provide. Rob Cope, Director of Remember A Charity, says: “Legacy giving is currently worth more than £2.8 billion to the charity sector, making it the largest single source of voluntary income. 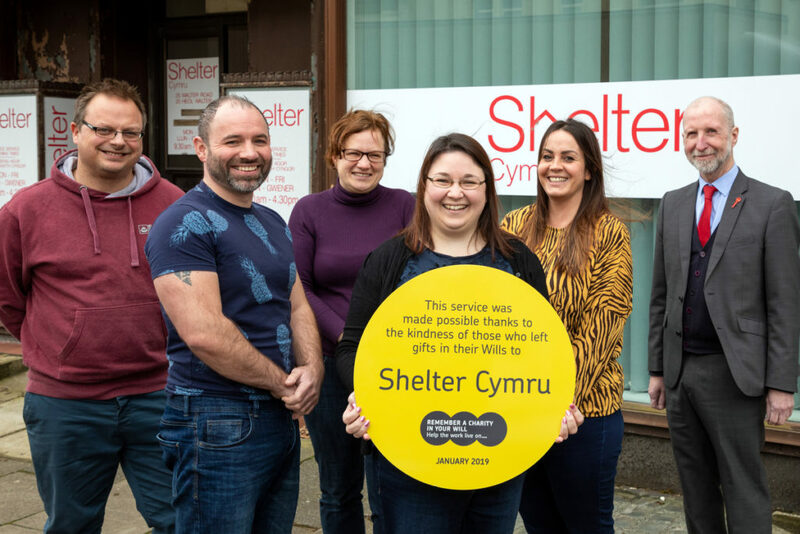 Without donors kindly gifting money to charities in their Wills, many important initiatives wouldn’t be possible – including Shelter Cymru Live. “The work Shelter Cymru Live is doing is incredibly important, helping those living in poor housing or facing homelessness. With the generosity of donors leaving gifts in their Wills, we believe in a positive future in their mission to end homelessness. It doesn’t matter how much you leave in your Will, even a small amount can make a huge difference”. John Puzey, Director of Shelter Cymru, says: “Over the past 38 years, legacy income has played a substantial part in helpingus prevent homelessness in Wales. Not only were we able to establish our national helpline which has gone on to become such a vital part of our support services, but legacies of all sizes continue to enable us to provide free, independent expert support and advice to thousands of individuals and families each year. Other charities that have previously been awarded a Yellow Plaque include Rainbow Centre, Guide Dogs, NSPCC and Cancer Research UK.